The middle-aged Korean owner had been glancing at me curiously ever since I walked into his restaurant with my wife. We had placed an order for pick-up, and as we waited for the food, he started talking to my wife, who is also Korean: Where was she from? What did she do? What was she studying? She answered everything politely despite her dislike for small talk, and then the owner gestured at me and asked if I was her little sister. He repeated this several more times as we waited for the food. All the while, I smiled politely and wondered what cruel things he said about the Vietnamese people who didn’t meet his standard of beauty. My wife was seething by the time we left the restaurant, but I wanted to put the incident behind us. It was only a microaggression, and Vietnamese people who aren’t as pale as I am have faced much worse, personally and institutionally. Still, the owner’s comments settled under my skin, adding to a collection of little hurts that had been building ever since I was young: Vietnamese people weren’t pretty; Vietnamese culture wasn’t cool or worthwhile; Vietnamese language sounded ugly. These things all reinforced the idea that to be a pretty, smart, and worthwhile Asian person was to be East Asian, or as close to it as possible. The people who told me those things growing up—who still say those things to me when they find out that I’m Vietnamese—were Asian. Many of them were East Asian, but there have also been plenty of Southeast Asians, Vietnamese and otherwise, who’ve self-deprecatingly said that there will never be celebrities in our communities as good-looking as the Korean and Taiwanese actors on their favorite television dramas. Such attitudes reveal the fact that it’s not just within interracial relationships that differences of privilege and power exist—they can exist in inter-ethnic relationships as well. Asian Americans are often lumped together into one homogenous group, but in truth, economic disparities exist between the many different ethnicities that comprise our community. The tension between East Asians and Southeast Asians in particular has also been inscribed on a geopolitical scale. The South Korean government rarely, if ever, acknowledges the atrocities committed by South Korean soldiers during the Vietnam War, despite the fact that the country’s participation contributed to its economic boom. Even after the Vietnam War, there remains a flow of labor from Vietnam to South Korea: data from September 2013 showed that the largest group of migrant spouses in South Korea was Vietnamese women. These migrant brides face cultural and language barriers that make them vulnerable to increased rates of domestic violence. These are all things my wife and I talk about. The history and the structural inequalities all lead to things like that restaurant owner telling me that I’m too pretty to be Vietnamese. But while questions of power and privilege must be navigated in our relationship, there’s also the day-to-day of sharing our lives as partners. When it comes to that, my wife and I find that our cultures inevitably intertwine. Chuseok, the Korean fall harvest festival, has a Vietnamese counterpoint in Tet Trung Thu, but we usually celebrate by making Korean mandu. Come spring and the Lunar New Year, however, we celebrate Vietnamese style: we exchange New Year’s greetings in Vietnamese and don’t clean the house, lest we sweep all the good fortune out. Perhaps the most obvious way in which our cultures meet is through the food we eat. Kimchi is a staple in our refrigerator, and there are almost always containers of pho in the freezer. I can make dakbokkeumtang, a spicy Korean chicken stew, and oi muchim, a cucumber salad kimchi, as easily as if I’d grown up eating them. My wife, who never liked pho until she tasted the homemade version, craves the soup whenever she’s sick. One of the highlights of her dining adventures was finally getting to eat fresh banh cuon at a restaurant when we visited Garden Grove for a concert featuring Noo Phuoc Thinh, our favorite Vietnamese pop singer. But even with food, questions of power and privilege arise. Food is loaded not only with cultural importance but also political meaning. When I was in college, I leaped to another Asian student’s defense when a white coworker mocked Filipino spaghetti as disgusting, making loud gagging noises to emphasize her point. I knew even then that the mockery wasn’t just about personal taste—it was about reinforcing the notion that people of color’s food is foreign and lesser. That is, until it’s made by white chefs. Then the food is elevated, transformed into something more elegant and palatable by their sheer whiteness. 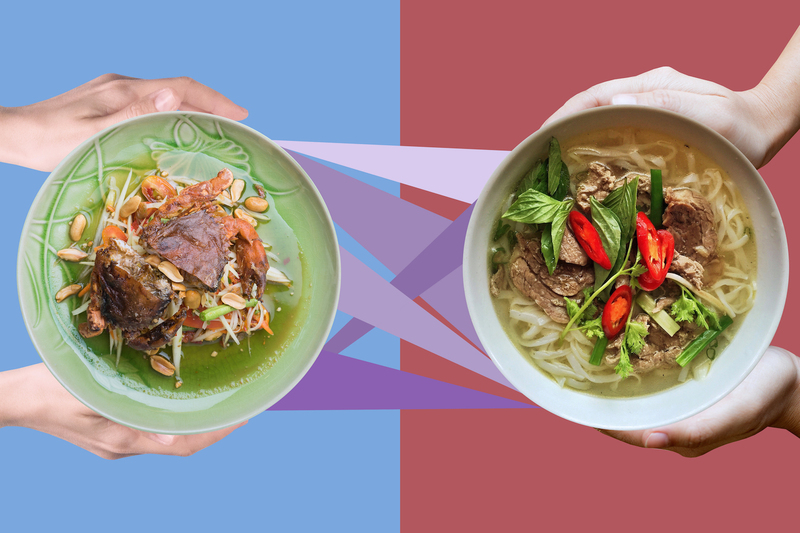 Because food is loaded with so much cultural meaning, it can also become one of the first things people latch onto when they want to learn more about a culture. In high school, I became an enthusiastic fan of Korean boy bands. Because of them, I wanted to know more about Korean culture, and among the easiest access points were the restaurants that dotted my neighborhood. Korean food took on a certain mystique for me: it was new, it was exciting, and I saw it as infinitely more cosmopolitan than the Vietnamese food that I’d grown up on. I wasn’t the only person to borderline fetishize eating another culture’s food—a former friend, another fan of Korean boy bands, once commented on a photo of grilled pork belly that I’d posted on Facebook, gushing in excitement and asking if it was samgyopsal. Samgyopsal is just the Korean word for pork belly, and Korean people are certainly not the only ones to conceive of the brilliant idea of grilling it. But my friend’s excitement seemed to indicate that there was something special in particular about the pork belly being Korean. It’s embarrassing to remember my past self, which is why I’m cautious about the way I approach Korean food these days. Is my enthusiasm for eating and cooking Korean food based on the same shallow motivations as before? Is my wife’s love for Vietnamese food inappropriate? It’s easy to think about these things when my family members make fun of me for cooking Korean food, or when they ask—half joking, half serious—why my Korean wife is trying to make Vietnamese xoi khuc. I like to think that even if one should approach making and eating food from another culture with caution, it shouldn't be completely off the table. After all, food is ultimately made to be shared. As politically loaded as it is, it’s also deeply personal. It’s ingrained with memories of family, childhood, and community. My wife and I talk about our childhoods through stories of food: my eccentricity is encapsulated in my old love for white rice mixed with fast food ketchup; her forthrightness comes through in a story of how she told a friend’s mom to please use meat for her kimbap next time. When I want to talk about the simple happiness I had as a kid, I talk about how excited I was for big family get-togethers and the fried rice, short ribs, and fried chicken they offered. Korean food doesn’t hold the same mystique for me that it once did; it’s simply an everyday part of my life. When my wife and I share our cultures’ foods, when we cook them, it’s not about claiming them as our own as white chefs do. It’s also not about using food as an easily consumable symbol of another culture. Cooking for my wife is simply another way to take care of her; sitting down to eat a meal together is just another way to connect and come together after a long day apart. That’s the beauty of food. Even if the rest of your relationship is hard to navigate, food is easy. All you have to do is sit down, pick up a pair of chopsticks, and let the flavors melt in your mouth.